Is it almost time to pose for your cheerleading photo? Get tips on how to look your best as the moment is captured in time. The quality of any cheerleader portrait depends a lot on the circumstances at the moment it's taken. However, you can increase your chance of getting some truly great shots by following these tips. 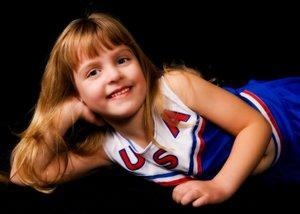 Of course, you'll want to wear your uniform in your cheerleading photo, so make sure it looks pristine. Plan to either have it washed or dry cleaned a couple days before your photo session is scheduled. Likewise, take a good look at your cheerleader shoes. Wipe them clean with a damp cloth and polish them if needed. Scuff marks will only spoil an otherwise perfectly nice photo. Replace the laces if necessary. Will you want to use some props in your photos? Pom poms and megaphones can add extra interest to the finished portrait. Give these items a good hard look and do any cleaning or maintenance necessary so they look fresh for your photo. Face: A clean face is essential for a good portrait. If you need to exfoliate, do it no later than the night before so any redness has a chance to subside. Wash your face with a gentle soap in the morning and apply a touch of moisturizer if you need it. Makeup is optional, but a little powder in your skin tone will help take away unwanted shine. If you do choose to wear makeup, try to keep it light so you still look natural in your photo. This is especially important if you plan to have a close up taken. Hair: Clean hair is also very important to the outcome of your photo. It's best to wash it while taking your shower the morning of the shoot. Once dry, it's best to style it away from your face so you're not hiding behind your locks. Most cheerleaders prefer to wear their hair up in their photo just as they would for game day. Rest: Be sure to get a full eight hours of sleep the night before the shoot. You don't want to wind up looking foggy with shadows beneath your eyes. Being well rested should make you look relaxed yet alert, and you'll be prepared to unleash a sunny, energetic smile when the photographer says "cheese". Practice: It wouldn't hurt to practice a few smiles and poses in the mirror before your photo session. This will give you an idea about which poses make you look your best. Just don't over do it, or you might wind up looking a bit too posed in your final portrait. Nutrition: This tip may not seem quite as obvious, but it's important to eat properly the day of the photo session. When you eat well, you feel healthier, and this will show through in the photos. Don't forget to stretch: Sometimes a cheerleading photo is an action shot. If you plan to take a jump or splits photo, you'll still need to stretch properly before you do just as you would before a performance. Otherwise, you'll risk an injury and chance ruining the session. You may be given the choice of taking your cheerleading photo in the studio or at an outside location. There are pros and cons to both options. Photos taken inside the studio can turn out perfectly well. A true professional will light the room properly to eliminate unwanted shadows. You will likely be able to choose a background you like, but try to judge for yourself just how realistic that background looks. Some "outdoor" background screens tend to look artificial. One of the biggest benefits of taking your cheerleading photo indoors is that you do not have to contend with the weather. Rain could ruin the entire shoot, and an overcast day could make the photos look slightly depressing. An excessively windy day could also present problems with your hairdo as well as the photographer's equipment. Honestly, there's nothing better than natural sunlight for taking a great photo. Natural sunlight brings out the true colors of the scene, and adds a sense of life to the photo that studio lighting just can't imitate. Additionally, real life backgrounds give any photo true depth. A screen background can't do that for you.The only real drawback to outdoor photography, as mentioned above, is that you can't control the weather. For this reason, make sure your photographer is willing to reschedule your session to a better day if the weather turns bad. In addition to your individual cheerleader portrait, plan to participate in a team photo as well. This photo may be done on the same day your individual photos are taken, but may also be scheduled on a separate day due to time constraints. If this is the case, you'll want to make the same preparations for both sessions so you'll always look your best!